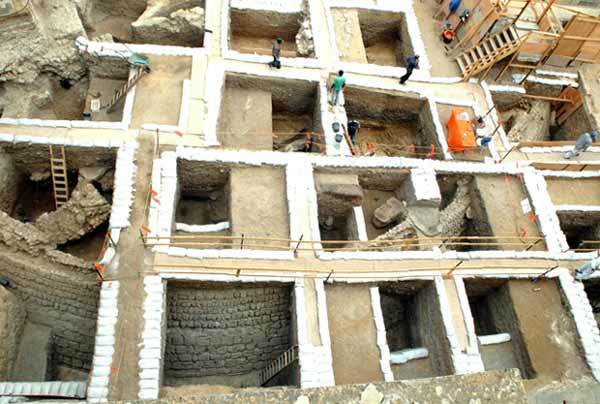 During 2007–2008, three seasons of salvage excavations were conducted within the precincts of St. Louis Hospital in Yafo (Permit Nos. A-5170, A-5522; map ref. 176775–863/662206–96), prior to the construction of a hotel and luxury residential units. 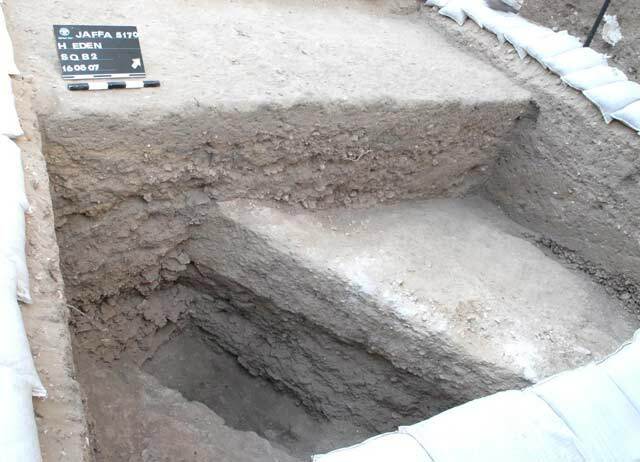 The excavations, undertaken on behalf of the Israel Antiquities Authority and underwritten by the Yefet 36 Company, were directed by A. Re’em, with the assistance of Y. Elisha, P. Gendelman and A. Dayan (area supervision), S. Ya‘aqov-Jam and E. Bachar (administration), D. Porotzky, V. Pirsky, V. Essman, M. Kunin, M. Kipnis, T. Kornfeld and S. Yogev (surveying), T. Sagiv and C. Amit (field and studio photography), Sky View Company (aerial photography), Y. Nagar and V. Eshed (physical anthropology), I. Berin (drafting), R. Vinitsky and O. Shorr (metallurgical laboratory), E. Kamaisky (pottery restoration), A. de Vincenz and E.J. Stern (ceramics), M. Shuiskaya (pottery and small finds drawings), Y. Gorin-Rosen (glass), R. Kool (numismatics), K. Raphael (metallic artifacts), H. Motro (archaeozoology), G. Finkielsztejn (Rhodian stamped impressions), E. Boaretto (Carbon 14 analysis), N. Amitai-Preiss (special finds), A. Haker (Greek inscriptions) and also A. Jubb (night watchman) and M. Ajami, D. Barkan, Y. Levy and M. Peilstöcker of the IAA Central Region. 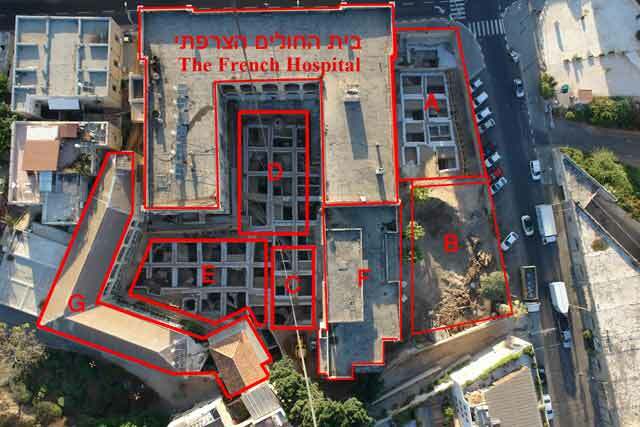 The hospital compound is located at the corner of Yefet and Louis Pasteur Streets, at the southeastern end of Old Yafo and at the foot of Tel Yafo (Fig. 1). The compound consists of four main components (Fig. 2): a U-shaped hospital building that was erected in 1879; a building in the Bauhaus style that was constructed in 1935 as an extension of the hospital’s southern wing (F); an L-shaped structure that was built in 1921 and served as a residence for the nuns (G); and a perimeter fence that enclosed the building complex and the open areas north and south of them, which were adapted for use as ornamental and vegetable gardens (A–E). The hospital building has three stories, two upper galleries and a basement level, built around a central courtyard. The design of the building incorporates both Neo-Renaissance and Neo-Gothic styles. A magnificent church, decorated with polygonal vaults and stained glass windows, molded plaster and wall paintings (Fig. 3), was constructed in the main wing of the building. When the hospital was founded, it served as a hostel for pilgrims who stopped in Yafo on their way to sites in the Holy Land. Over the years it became a pharmacy and a hospital, run of nuns of the French Order of St. Joseph of the Revelation. The Government of Israel had rented the hospital building in the 1970s and ran it as a mental institution until 1995. The building was rented to an outside entrepreneur in 1997 and the nuns’ order continued to occupy the residential wing and other wings of the building until July 2007, when the archaeological excavations had begun. Many excavations had been conducted in the immediate vicinity of the hospital compound over the years, but the compound itself had never been excavated. 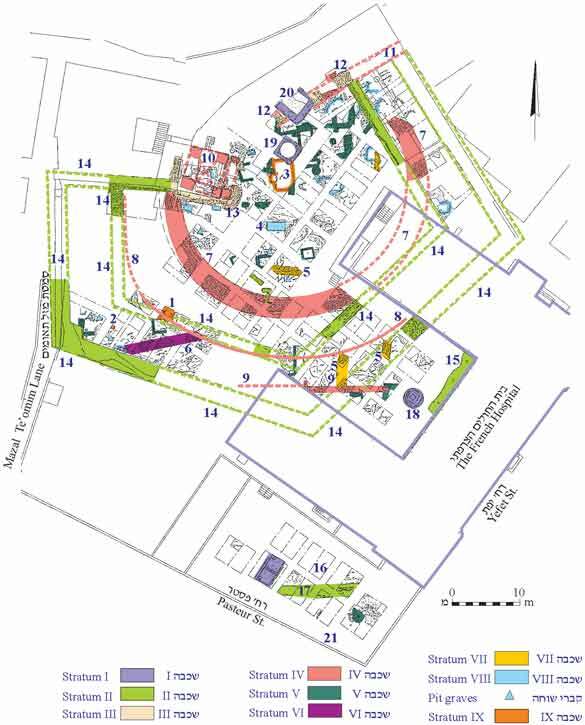 Eight excavation areas were defined in the compound (1,700 sq m; Fig. 2), but only six were excavated (a total of 60 squares; not all squares were a standard size due to space restrictions): the hospital building (not excavated), the open areas of the compound (A–E; Area B was not excavated), the area of the Bauhaus building (F) and another area in the nuns’ residential wing (G); the last two buildings were completely removed prior to the construction. The excavation reached bedrock in many parts of these areas; bedrock will be reached in the rest of the excavation areas in subsequent seasons. The main finds are attributed to the system of fortifications that defended the southeastern corner of Yafo at the time of the Crusader kingdom and in the Ottoman period and included a glacis, in whose forepart a fortified structure that may have been a tower or gate was built (below, ‘the Bastion Building’, Phases 1 and 2) in the Crusader period; and a bastion from the Ottoman period that was constructed on top of the glacis and incorporated the Bastion Building, which was enlarged in this phase (Phase 3). 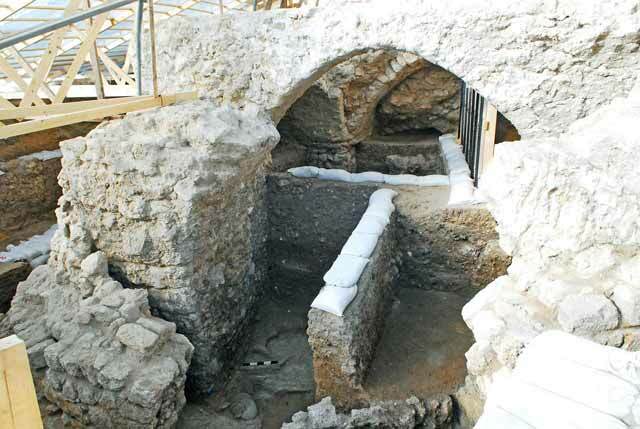 This find is of great importance not only because of its enormous size and fine state of preservation, but also because distinct fortification remains that definitely dated to the Crusader city are exposed for the first time in the history of excavations in Yafo. Extending south of the fortification system is a burial field from the Late Bronze Age and the Persian and Hellenistic periods, whose continuation had previously been exposed in the Andromeda compound, south of the excavation area (ESI 18:55–56). This burial field aids in reconstructing the limits of ancient Tel Yafo. The different strata are described below from earliest to latest. Stratum XI. The region was used for burial in the Late Bronze Age. A rock-hewn burial cave whose ceiling had collapsed was discovered in Area F (Fig. 4:1). The cave was not excavated, but the fill inside it contained human bones and fragments of pottery vessels, including bowls, among them ‘milk bowls’, jars and juglets. A rock-hewn shaft (diam. 0.6 m; Fig. 4:2), which probably led to another burial cave, was discerned nearby. A circular bedrock-hewn pit, apparently another burial cave (Fig. 4:3), was discovered in Area E, but not excavated. 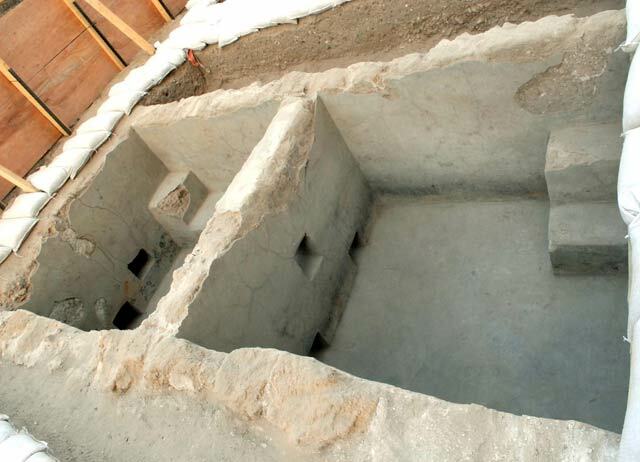 A small opening that led to a hewn burial chamber was installed in its bottom. Lying on the floor of that chamber were chunks of bedrock that had become detached from the ceiling. A few potsherds from the Late Bronze Age, which probably swept along with the alluvium from the tell, were found in the accumulations and in the debris that was ascribed to later strata. It seems therefore that the southern boundary of the ancient tell should be located north of the excavation area. Stratum IX. The cemetery continued to exist in this region during the Persian period. At least thirteen tombs that could be divided into two types were identified in the different excavation areas. The first type included rock-hewn pit graves for single interments and the second was burial caves used for multiple interments. The burial caves, which were mostly discovered in Area E, have not yet been excavated, as is the case with most of the pit graves. The tombs were found covered with ground kurkar sand, and in some of them human bones and fragments of pottery vessels from the Persian period could be discerned. 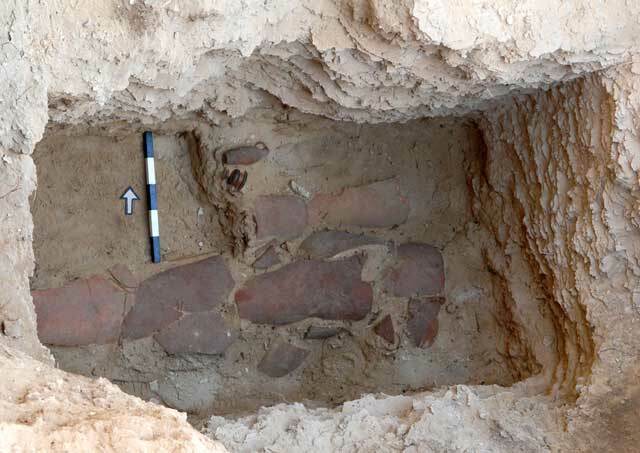 A single rectangular pit grave in Area E underwent preliminary documentation: it was meticulously hewn and the body of the interred individual was covered with large jar fragments that rendered it the appearance of an anthropomorphic coffin (Fig. 4:4, 5). Alongside the deceased were funerary offerings that dated to the fifth–fourth centuries BCE and included intact pottery vessels, among them a juglet, a skyphos and an oil lamp, as well as jar fragments. Several objects dating to the Persian period, although not in situ and including an alabaster vessel were exposed in later strata. Anthropomorphic and zoomorphic figurines dating to the Persian and the beginning of the Hellenistic periods were also found, ex situ. Stratum VIII. The remains attributed to the Hellenistic period included simple pit graves and the foundations of a large structure (public building? Areas D, E). 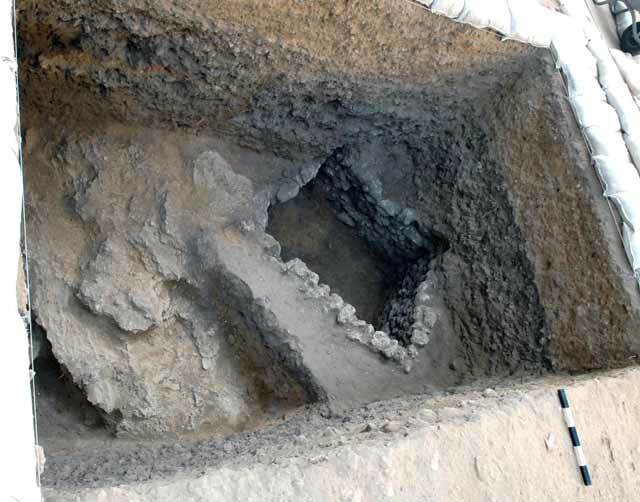 Six pit graves were discovered; the deceased, laid in supine position, were interred in natural bedrock depressions with funerary offerings arranged on either side of them. These gifts included pottery vessels, primarily bowls and amphorae, which were found intact. Some of the graves were damaged when the foundation trenches of a massive building were dug slightly later than the time of the graves. A single course was preserved in the bedrock-hewn foundation trenches (width 1.2 m); it was built of fieldstones that were roughly worked into a rectangular shape and arranged as headers (Figs. 4:5, 6). The foundation trenches were sealed with accumulations from Stratum VI; however, they were partially destroyed by the construction of the Crusader moat of Stratum IV. The nature of the structure is unclear. It could have been a mausoleum since this region was used for burial, but it is also possible that the structure served as a fortified position, built outside the walls of the Hellenistic city, within the necropolis area. Finds from the Hellenistic period were recovered from the fill overlying the kurkar bedrock in all the excavation areas. These included fragments of pottery vessels from the third–second centuries BCE, among them imported wares from Attica, Egypt and Asia Minor. Thirteen Rhodian handles that dated to the third century BCE, coins, most Ptolemaic (third–second centuries BCE) and ceramic loom weights were identified in the layers of fill from later strata. These finds, like the rest of the artifacts from the Hellenistic period, are attributed solely to the Early Hellenistic period; there is no evidence of settlement in the Late Hellenistic period (the Hasmonean era; first century BCE). Stratum VI. Building remains and accumulations that yielded different finds were attributed to the Byzantine period. Although tombs from this period were discovered in the Andromeda compound nearby, no graves whatsoever were found in the excavated areas. That indicates that the northern boundary of the burial field from the Byzantine period is located south of the hospital compound and that the excavation areas were included within the precincts of the Byzantine city, or extended along its foot. A foundation of fieldstones (exposed length 11 m, width 2.5 m), placed over the kurkar bedrock, was uncovered in Area F. It was oriented northeast-southwest (Fig. 4:6) and may have been the base of a massive wall. The fill in the foundation contained fragments of a decorated marble baptismal font. Other finds in Area E included scant and fragmentary building remains, habitation levels and the floor of an installation. A pale red accumulation of soil above bedrock was discovered in Area D. The accumulation had been severed when the moat from Stratum IV was installed. It yielded potsherds from the fifth–sixth centuries CE, among them imported fragments that included red-burnished wares from North Africa, Phocaea and Cyprus and amphorae from Syria, as well as local wares and Gaza jars. Some of the potsherds were adorned with incised crosses. Other finds from the accumulation were several worn potsherds that dated to the Early Roman period (first century CE), including terra sigillata ware, cooking pots and stone vessels in the Jewish tradition, which attest to a settlement in this period. The numismatic finds from this stratum date mostly to the sixth–seventh centuries CE and consist mainly of bronze folles. 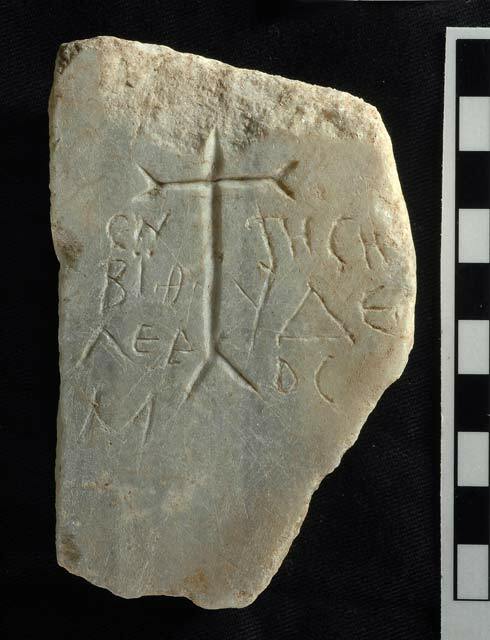 Finds from the Byzantine period, discovered in fills from later strata, included roof tiles, pieces of pavement and fragments of marble opus sectile inlay that apparently came from a large public building, as well as a small fragment of a marble tile, bearing a pilgrim’s graffiti beside a cross in which he implores Jesus for mercy in the world to come (Fig. 7). It seems that the finds may have originally come from a church, which dated to the Byzantine period and possibly stood in the area; it was either completely destroyed or its location should be sought nearby. Stratum V. It seems that a residential quarter was situated at the site during the Early Islamic period (eighth–tenth centuries CE); fragmentary building remains have survived throughout all the excavation areas (Fig. 4). These included the foundations of walls, sections of floors, plastered installations, square cesspits (Fig. 8) and storage pools, which were founded on the remains, accumulations and fill of Strata VIII and VI. Several construction phases were identified in some of the houses, including the raising of floors and the canceling of walls. A section of an Arabic inscription, whose minute dimensions made it difficult to decipher, was incorporated in the floor of one of the houses. The accumulations of this stratum were characterized by dark brown soil and an abundance of potsherds that dated from the middle of the eighth–tenth centuries CE and included buff-ware vessels, jugs, glazed bowls and plates, cooking pots and glazed fry pans, as well as two jar handles stamped with a pentagram that is meant to ward off the evil eye, a doll made of bone, spindle whorls, coins that mostly dated to the Abbasid period (ninth century CE) and two Arabic inscriptions stamped on jar handles: one mentions the monastery of Deir Samwil and the other reads "One God." Stratum IV. An impressive fortification of unusually large dimensions, dating to the Crusader period, was exposed; it consisted of a built glacis (Fig. 4: 7) with a moat alongside it (Fig. 4: 8, 9), a massive pillared building (‘the Bastion House’; Fig. 4: 10), possibly the remains of a tower or gate, in which two construction phases, ascribed to Stratum IV, were identified and a third phase was ascribed to Stratum IIB (below), and a city wall that delimited the glacis from the northwest and had survived only by its foundation trench (Fig. 4: 11). The glacis and the moat alongside it, whose remains were discovered in all the excavation areas, were built along a circular or elliptical route (diam. c. 35 m; Figs. 9, 10). The glacis was preserved to an almost uniform height (in excess of 3 m). It seems to have been originally much higher and its upper part was intentionally removed during the Ottoman period, when fortifications (Strata IIB–IIA) were founded above it, or possibly during the Mamluk period. The glacis was built along a uniform slope and together with the moat, had penetrated into the fills and remains from earlier strata. The glacis’ foundation course was built of ashlars founded on bedrock at right angles to the slope of the glacis. Where bedrock surface was high, the rock was hewn so as to deepen the base of the glacis and the bottom of the moat. The slope of the glacis was lined with ashlars, bonded with pale gray mortar and placed on a bedding of small fieldstones. Rather large, well-dressed ashlars (average size 0.4×0.5 m) were utilized in the bottom courses of the glacis, whereas the upper courses consisted of smaller ashlars (average size 0.2×0.3 m) that were somewhat carelessly dressed. The difference probably stemmed from the angle of inclination that became more acute toward the top of the glacis or alternatively, it is possible that the upper courses were a later repair, although no archaeological evidence at this stage of research corroborates it. The moat (max. upper width 14 m; Fig. 4:9) becomes narrower toward its bottom (width 6–7 m; Fig. 4: 8). The side opposite the glacis is inclined but unlike its counterpart, it is not lined with stones, but rather sealed with a layer of ground and packed kurkar (Fig. 10). Grayish black fill accumulated in the moat. Signs of destruction or stone collapse were not found and it is therefore concluded that the moat was sealed in an orderly and intentional manner. The ‘Bastion House’ (Fig. 4: 10) was exposed in Area G. It was a square building in the first phase, which included four cast pillars (1.5×1.5 m) that carried broad deep arches (Fig. 11). The pillars were founded on the kurkar bedrock and therefore penetrated through Strata V, VIII and IX. The castings consisted of a jumble of small and medium fieldstones together with pale gray mortar mixed with pieces of charcoal and lime. Another pair of pillars (1.1×1.1 m) was affixed to the eastern pair of pillars in the second phase. The added pair was built in the same manner and founded on bedrock; the arch between the pillars was raised. The purpose of the building is unclear but its location, size and method of construction indicate that it was connected to the fortification system and possibly served as a foundation for a tower/gate or as a base of a bridge. A section of a foundation trench (length 11 m), probably that of the wall that delimited the glacis from the northwest in the Crusader period, was exposed in Area G. Only the eastern side of the foundation trench, which severed buildings from Stratum V and was hewn in the kurkar bedrock along a southwest-northeast axis (Fig. 4: 11), was exposed. Although its western side was not excavated due to technical problems, it seems that the trench was intended for the construction of a fortification, possibly a wall whose width was in excess of 2 m. The fortification was almost completely robbed, as evidenced by the robber trench that reached the bottom of the foundation trench. It has only survived by a section of a cast mixture of fieldstones and mortar and several ashlars that allude to the building technique employed in its construction. It seems that the wall built inside the foundation trench was connected to the fortification system, which included the ‘Bastion House’ (both phases) and the glacis, but the relationship between them has not yet been clarified. The military nature of this part of the city in the Crusader period is indicated, along with the fortifications, by the metallic artifacts from the period that were recovered from the excavation: arrowheads and spearheads, as well as rare spike-like artifacts (caltrops, Fig. 12) and a war axe. The archaeozoological finds in this stratum included a considerable quantity of pig and horse bones. This point to the diet of the people in the Latin Kingdom and the important role of the horse in it, as well as to the considerable difference between this diet and that of other social classes, which is characterized by an overwhelming presence of goat, sheep and cattle bones. It is odd that no remains of a city wall, which in Crusader fortifications were usually built on top of the glacis or the glacis leaned up against it (talus), were discovered. Moreover, the elliptical shape and the large circumference of the glacis are unique and so far, no explanation has been found for this; furthermore, the location of the fortification in the Crusader city is insufficiently clear. However, a comparison of historical sources and fortifications known from the coastal Crusader cities shows that the architectural find could be the southeastern corner of the lower city (faubourg), which included a large round tower, as evidenced by the course of the glacis; or alternatively, this was part of a fortification – a fortress or donjon – that was constructed within the precincts of the walled city. The identity of the fortifications builders is also shrouded in uncertainty. The pottery vessels dating the different components of the fortification system are ascribed to the mid-twelfth century CE and the first years of the thirteenth century CE. The numismatic finds from this stratum are quite poor and most of them are coins that bear the name of King Amalric (1163–1174 CE), which were apparently struck at the mint in Jerusalem. Based on these dates, it seems that the construction of the fortifications should be credited to Richard I (the Lion-Heart; 1191–1192 CE) and Frederick II (Barbarossa; 1225–1243 CE) and his son, who according to contemporary sources, renovated the city walls during these years. However, it is also possible that the scant fragments of pottery vessels upon which the dating of the fortification is based, originated from the nearby vicinity and not from the fortifications themselves, which were built in the mid thirteenth century CE by Louis IX (1250–1254 CE), who was the great builder of the Crusader coastal cities. Potsherds from the thirteenth century CE and a coin from the Mamluk period were found in the fill inside the moat. E.J. Stern suggests that the find probably indicates that the moat was blocked during the Mamluk period. It seems that this date is appropriate because the fortifications in this region were destroyed and abandoned during the Mamluk period. With the exception of a refuse pit in Area E, which was dug into the ancient strata and is ascribed to this period, and several coins from the fourteenth century CE that were discovered in Strata IIB–I, no remains that dated to the Mamluk period were discovered. The absence of finds from this period is consistent with contemporary historical sources and the archaeological evidence that has been uncovered in excavations, conducted in recent years in Yafo, which indicate that the boundaries of Yafo were diminished in the Mamluk period and extensive portions of the city were ruinous and desolate. Stratum IIA. 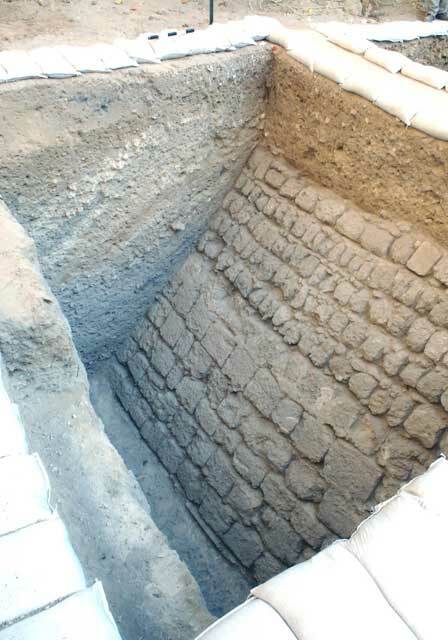 The foundation of a wall that extends northeast-southwest (exposed length 15 m, width 2.2 m; Fig. 4: 12) and ascribed to the eighteenth century CE were exposed. The course of the wall was along that of the city wall from Stratum IV, whose foundation trench was discovered c. 0.5 m below the foundation. The foundation included relief arches upon which the wall was set, and several foundation courses that together were preserved to a maximum height in access of 2 m. It is assumed that the wall was connected to the northeastern corner of the third construction phase of the ‘Bastion House’, but the presumed point of connection has not yet been excavated. The Stratum IV building of the ‘Bastion House’ was made thicker in the third construction phase. It was enclosed within ashlars construction, so that a square building with round corners was formed, probably a tower that rose to a great height (Fig. 4: 13). Three sides of the building were exposed; the fourth is concealed beneath modern structures. The walls of the tower were built on broad and deep relief arches, one on each side. The walls and arches were preserved to a maximum height of 5.5 m. The tower’s foundation penetrated into the remains of the glacis from Stratum IV and consequently, it is impossible to determine the relationship between the glacis and the first two construction phases of the ‘Bastion House’. A few potsherds that dated to the eighteenth century CE were found in the foundation trenches of the tower’s walls and in the robber trenches of the walls. These fortifications are the defenses that Napoleon destroyed when he conquered Yafo in 1799; the tower appears on the Jacotin map as Tour ébréchée (meaning the ruinous or cracked tower). Stratum IIB. The southeastern corner of the Ottoman fortification system from the beginning of the nineteenth century CE, in which fortification remains from Stratum IIA were incorporated, was exposed. The defenses, which are surprisingly in keeping with the descriptions in historical and cartographic sources of the period, were constructed by the Ottoman ruler Mahmoud Agha a-Shami Pasha, known as ‘Abu Nabbut’, with the assistance of the English following Napoleon’s retreat. The fortification system included the inner city wall and the tower (‘Bastion House’) from Stratum IIA (Fig. 4: 12, 13); a fortified bastion (Fig. 4: 14) that overlooked the base of the city wall and the southeastern approaches to Yafo, which was affixed to the outside of the inner city wall from Stratum IIA; a forward rampart (fausse-braye; Fig. 4: 15), which encircled the bastion and the city wall (Fig. 4: 16) and the wall opposite it (Fig. 4: 17) that enclosed the fausse-braye. The bastion is a pentagonal structure built of an inner wall (width 1.5 m) that enclosed a courtyard and an outer wall (width 2.5 m) that was built parallel to the inner wall. The surface extending between the two walls, which abutted the inner wall of Stratum IIA, was used for soldiers to move around and for cannons to be positioned. The foundations of the bastion and their robber trenches were exposed in all the excavation areas. The outer wall of the bastion (Fig. 4: 14; Area F) was incorporated in the perimeter fence that surrounded the hospital compound facing Mazal Te’omim Lane, which contributed to its preservation of 3 m high (Fig. 13). The pillars that bore the upper story of the bastion were identified between the walls of the bastion (Area G). A forge for manufacturing cannonballs operated in the bastion’s courtyard. The forge was survived by a rectangular installation that contained a thick layer of ash and charcoal. Numerous cannonballs were found within the precincts of the bastion and near the installation, deformed cannonballs that were damaged during the manufacturing process, along with metallic slag and burnt kurkar stones that changed their shape due to the high temperature, were discovered. A section of the fausse-braye was exposed in Area D (Fig. 4: 15). It consisted of a broad strip that surrounded the outer wall of the bastion and extended as far as the moat. The floor of this surface was a tamped layer of ground kurkar and mortar, which was placed on top of the fill from previous strata. This surface was the last line of defense before the bastion, where it was possible to trap the enemy if he already breached the moat and was about to break through the walls of the bastion. The surface was damaged when the foundations of the building from Stratum I were constructed. A section of the moat (presumed width 13 m; Fig. 4: 16) that encircled the forward fighting surface (fausse-braye) was exposed in Area A. The robber trench, which is the foundation trench of the wall opposite the moat (exposed length 8 m, width 2 m; Fig. 4: 17) was also revealed. A casting of fieldstones and hamra that was found in the foundation trench is a building method characteristic of Ottoman fortifications. The moat and the wall opposite it, built on an incline and lined with a thick layer of ground and tamped kurkar (Fig. 14), were deepened into the fill of previous strata. Fill containing finds from the nineteenth century CE was found in the moat. Stratum I. The city walls were breached and the moat was blocked in the 1870s and 1880s. This was the signal for Yafo to spread out toward the east and north. 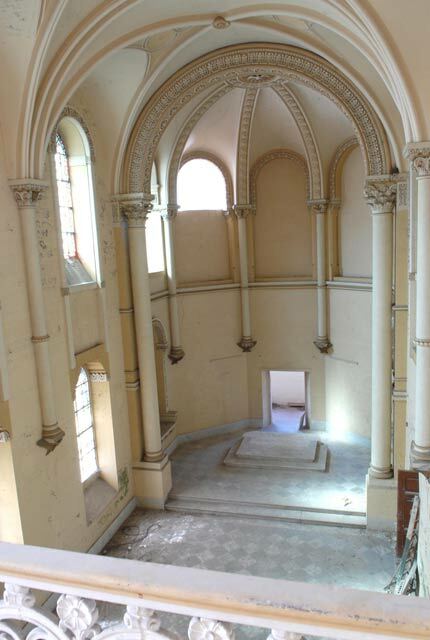 One of the first buildings outside the walls is the U-shaped structure that was built by the French government and served as a hostel for pilgrims; over the years it was turned into a hospital and its date of construction, 1879, is stamped in plaster on the ceiling of the church. 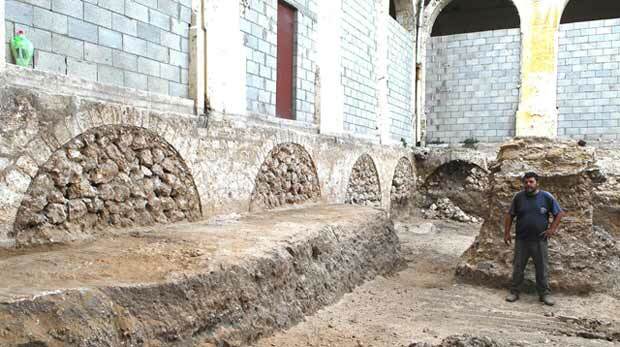 The excavations in the church exposed the tomb of L'abbé Lucien Gélas, one of the founders of the hostel, who was interred beneath the church’s floor in 1884. The excavation finds in the building reveal the construction method that was utilized in the Ottoman period: the building was founded on a system of relief arches arranged at set intervals (Fig. 15); the walls of the bastion from Stratum IIB were integrated in the construction of the foundations. Two wells were documented in Areas D and E. Their openings were situated at the level of the hospital’s courtyard and both were hewn in the kurkar bedrock, down to the level of the aquifer (Figs. 4: 18, 19; 15). The remains of a pumping mechanism that conveyed the well water to an adjacent pool were visible alongside the opening of the well in Area E (Fig. 4: 20). The wells were probably sealed when modern water supply systems were installed. An installation consisting of three open cells (2×2 m, depth 1.4 m; Figs. 4: 21; 16), arranged in a row and coated with Portland plaster, was exposed in Area A. 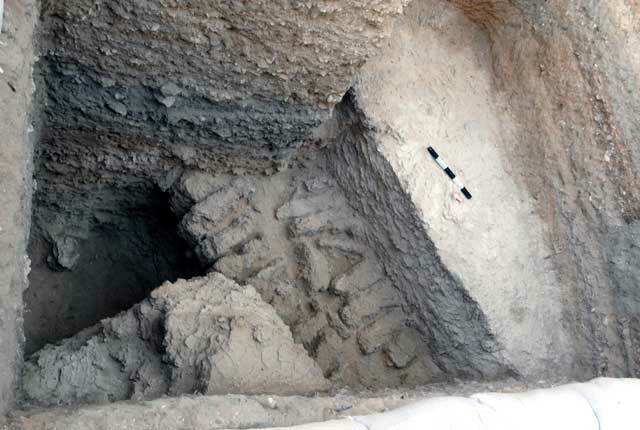 Steps that descended from the surface to the bottom were found in two of the cells; the third cell, located in the excavation balk, was not entirely exposed. The cells were found replete with fill that contained large quantities of dismembered chicken bones, burnt marks and a layer of soot, medicine bottles and artifacts from the beginning of the twentieth century CE. It seems that the installation was converted for use as a refuse pit for the hospital kitchen, after it was no longer utilized for its original purpose, which is not clear. It may have been used as a laundry or for bathing the lepers who resided in a special building (lasarette), which stood a short distance south of the installation. The excavation in the FrenchHospital enabled us to draw the southern boundary of ancient Tel Yafo. The settlement from the Bronze Age until the Hellenistic period extended north of the excavation areas, which were used in these periods as a cemetery. During the Byzantine period, Yafo began to expand southward, a process that intensified in the Early Islamic period, as evidenced by the exposed settlement remains. It therefore seems that the city limits in these periods should be sought south of our excavation. This part of the city was fortified in the Crusader period. It was deserted in the Mamluk period and re-fortified in the Late Ottoman period, when the large central bastion of Yafo was constructed; its northern counterpart was recently exposed in the Qishle excavations (HA-ESI 121). The modern construction in this region – the hostel/hospital building, the nuns’ residence and even the adjacent alleys of the city – was founded on the remains of the Ottoman fortifications, while maintaining the layout of Yafo’s ancient town plan. 2. The hospital compound, an aerial view at the end of the second season, looking east. 3. The church in the hospital building, looking north. 5. Area E, a tomb from the Persian period, looking south. 6. Area D, building foundations from the Hellenistic period, looking south. 7. A Greek inscription on a marble fragment. 8. Area E, a cesspit dating to the Early Islamic period, looking south. 9. Area C, the glacis from the Crusader period, looking south. 10. Area C, the glacis from the Crusader period and the fill in the moat, looking west. 11. Area G, the three phases of the ‘Bastion House’, looking west. 12. 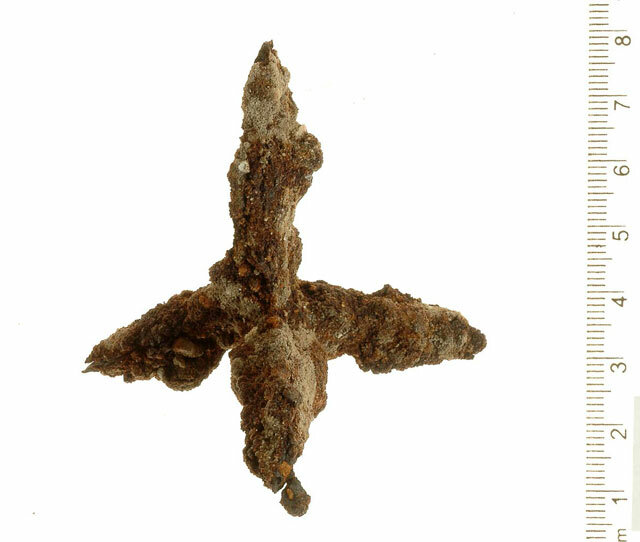 A metal spike (caltrop) from the Crusader period. 13. The outer wall of the bastion, integrated in perimeter wall of hospital compound, looking north. 14. Area A, robber trench of the opposite wall and moat lining from the Ottoman period, looking east. 15. Area D, foundation of the hospital (relief arches) and the well (on the right), looking northeast. 16. Area A, installation, looking west.